Sheriff John Hanlin’s infamous 2013 letter to Biden echoes many themes of the radical antigovernment right. In the wake of the mass shooting at Umpqua Community College in Oregon, Douglas County Sheriff John Hanlin has already gained some unpleasant notoriety for having sent a letter to Vice President Joe Biden in early 2013 that decried any gun control measures in the wake of the shootings in Newtown, Connecticut. Hanlin also pledged not to implement any such laws. The letter has been widely reported in the media, but, in fairness to Hanlin, we don’t yet know if his apparent reluctance to enforce gun-control laws—including some recently passed Oregon measures—might have made it easier for the shooter, Chris Mercer, to carry out his plan. Given that Mercer only recently moved to the area, perhaps not. But Hanlin’s letter deserves close scrutiny nonetheless, because Hanlin is not alone. 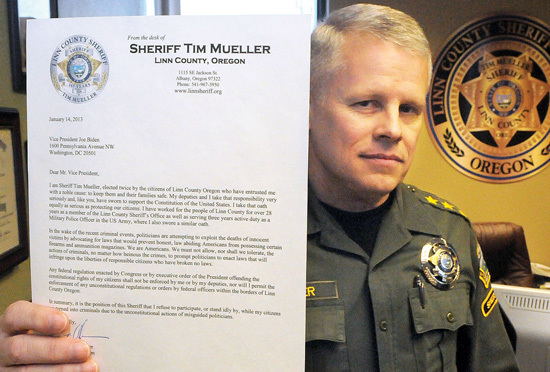 Hundreds of sheriffs across the country have sent similar letters, and if their actions match their words, already weak American gun control laws are being subtly loosened and disregarded by law-enforcement professionals nationwide. 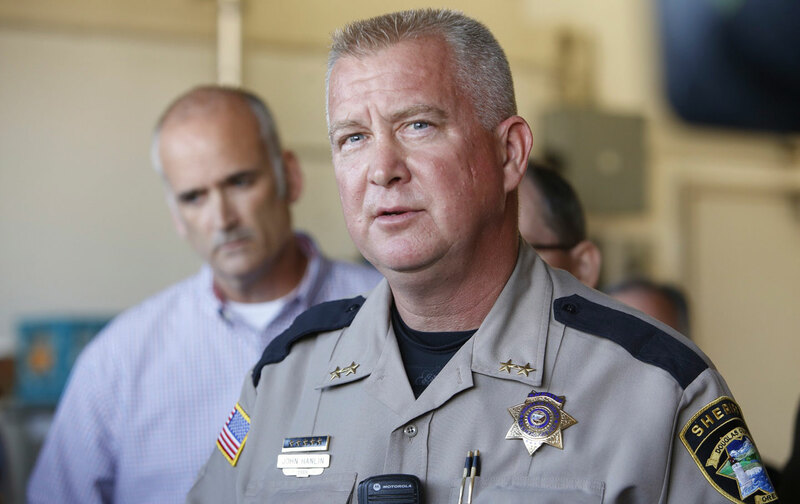 More ominously, the specific language used by many of these sheriffs—including Hanlin—evokes certain themes and talking points of violent antigovernment movements that have persisted in America for decades. In conclusion, it is my position as Sheriff of Douglas County, Oregon that I will refuse to participate in, nor tolerate enforcement actions against citizens that are deemed unconstitutional. The idea expressed here, that sheriffs are the ultimate arbiters of constitutionality, has become a popular idea on the radical right. There are several national movements that champion this cause, and their proximate intellectual leader is a former Arizona sheriff and radical-right hero named Richard Mack. In 2011, Mack formed the Constitutional Sheriffs and Peace Officers Organization (CSPOA), which he believes is a “line in the sand” against federal authorities. “In short, the CSPOA will be the army to set our nation free,” Mack wrote on the group’s website. CSPOA boasts 485 sheriffs as signatories to a pledge “to uphold and defend the Constitution against Obama’s unconstitutional gun control measures.” Among them is Hanlin. This movement around the supremacy of the local sheriff has deeper historical roots beyond Mack or Hanlin. According to the Southern Poverty Law Center, it can likely be traced to the Posse Comitatus movement that arose during the Midwest farm crisis of the 1970s and 1980s. As family farms collapsed, many people blamed federal policies for the disaster, specifically tax laws and price-support systems that lead to rapid growth of corporate agribusiness at the expense of small farmers. These sort of groups have waxed and waned in popularity through the years, sometimes dramatically: Terry Nichols, who helped plan the bombing of a federal building Oklahoma City, considered himself a sovereign citizen. But they exploded in popularity under Obama. Groups that espouse similar views are now broadly referred to as the “Patriot” movement. There were 149 of these groups in 2008, before Obama was elected; by the end of 2011, there were 1,274. The Southern Poverty Law Center says Mack “has been an important player in the resurgence of the Patriot movement.” On the CSPOA website, alongside the membership list that includes Hanlin, are advertisements for survivalist services that sell freeze-dried foods, and a dating service called PatriotDate.com. Rural Oregon is fertile ground for this sort of thinking. The SPLC has documented 31 Patriot groups in the state, mostly in rural areas. In Douglas County, where Hanlin presides, there is deep antipathy towards the federal government for hurting the local timber economy by moving to protect spotted owls in the early 1990s, as Jim Tankersley notes in a quick sketch of the county for The Washington Post. Unemployment in Roseburg is at 8 percent, well above both national and state levels. Hanlin’s apparent adherence to this ideology is also unsurprising because it has increasingly taken root in some corners of American law enforcement, as CSPOA’s signatory list demonstrates. The Oath Keepers were briefly in the news during the Cliven Bundy standoff in 2014; many of the armed guards around his compound were Oath Keepers. The shooting in Roseburg has incidentally exposed this group and others like it to public view once again—perhaps only to fade quickly into the background just as before. The news coverage around Hanlin has shifted towards his supposedly brave refusal to speak the Umpqua shooter’s name.